Joy Creek Photo Archive (c) all rights reserved In general, we grow plants in our garden for ornamental, not culinary purposes. It is always a pleasure to find a berrying shrub that has incredible ornamental appeal. 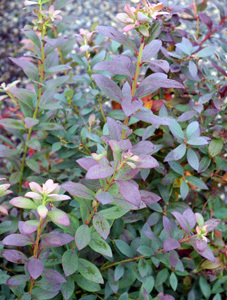 This shrub has rounded foliage that is glaucous blue. Young growth has a bronze cast to it. The small bell-shaped flowers begin pink and fade to white. And, perhaps best of all, Vaccinium 'Sunshine Blue' produces loads of delicious berries over a long period of the summer. A Great Plant Picks selection. Spring. 3 ft. x 3 ft.